What’s happened? What’s going on? In the last quarter of 2013 we excitedly received the generous donation of two telescope systems with imaging equipment. In December we assembled the telescopes and will soon be testing them out. One of the scopes is a 6-inch Celestron refractor and the other is a massive 10-inch Meade SCT; both have computer controllers and sturdy tripods. The 10-inch is of particular value to us because it represents a good-sized telescope that we may one day soon use in public programming and education. The computerized “go-to” capabilities of both instruments makes them especially valuable under Hiram’s very good but less-than-perfect dark sky conditions. Finding deep-sky “faint fuzzies” such as nebulae and galaxies can be a real challenge with any light pollution! The modern drive system should also make astro-imaging possible for us and the 10-inch aperture of the Meade gives it very good light collecting abilities. We welcome donations of high-quality telescope equipment but do request prospective donors contact us first … not all telescopes are well-suited to our needs! Eventually we hope to also acquire a large instrument — 14-inch or bigger — to serve as a modern counterpoint to the grand vintage refractor currently the centerpiece of Stephens Memorial Observatory. When a new astronomical facility is built, we would like to be able to display and use some the best of both old and new technologies. 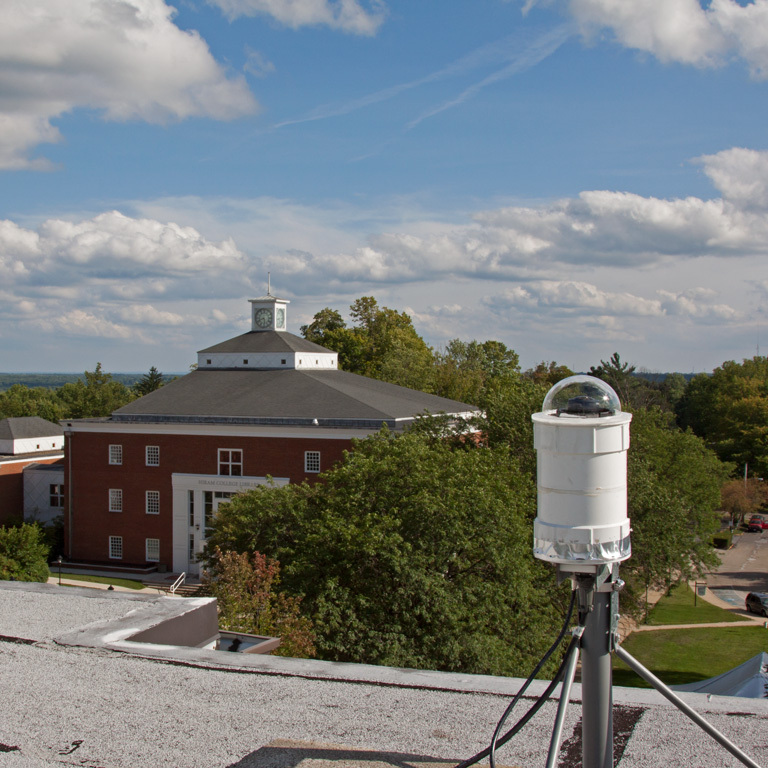 On August 13, 2013, Hiram College became the latest host for one of NASA’s All-Sky Camera Fireball Network stations. The automated camera system watches the sky every night for exceptionally-bright meteors called fireballs. If a fireball is detected, video from the camera is uploaded to a server computer at NASA’s Marshall Space Flight Center in Huntsville, Alabama where the images are analyzed. Captured images are compared with those from neighboring camera locations to determine such factors as the meteor’s altitude, speed, direction, and even its original orbit. The data may also be used to determine approximate location, should a larger meteor survive its trip through Earth’s atmosphere to hit the ground, then being renamed a meteorite. Installed just after the peak of the annual Perseids meteor shower, Hiram’s camera imaged several fireballs on its first night of operation and many more over the next few nights. Hiram’s request to join the network resulted in the development of three additional Fireball Network stations in the region: Oberlin College, Oil Region Astronomical Observatory, and the historical Allegheny Observatory, near Pittsburgh, Penn. The office dehumidifier was replaced at the end of January 2012. The old unit did an excellent job but may have worn out working year ’round protecting the Observatory office from excess moisture. We suffer from “rising damp” in the front part of the building — fortunately not under the dome with its raised and ventilated floor! Without a dehumidifier, we have actually seen moisture dripping from the walls, and we had to discard a number of items due to the extreme moisture levels! The Observatory’s telephone is being shut off in March 2011. This will help Hiram College save a bit on operating expenses. Frankly the “land line” was more important a few years ago when cellular service was not-so-good in Hiram. These days, thanks to the cell phone tower on campus, service is very good and the Observatory’s phone line is much less important. All we’ve used it for was program announcements; it’s not needed for emergencies. Check the Observatory’s home page on the Web or follow us on Twitter for program announcements, cancellations, and so forth. Contact us with any questions via email or direct messages on Twitter. New lighting has been installed in the observing area –where the big telescope resides– replacing a rusting and inefficient old (not antique) fixture. The new, industrial-style, glass-enclosed lighting provides a very bright white light for times when we wish to work in the dome with the shutter closed. There is also a much dimmer red light for use during observing sessions. Both lamps are compact florescent and consume much less electricity than their incandescent counterparts. Trial and error will determine just how much we will need to block the red light for good night illumination without glare into the eyes. Done early November 2009. Well, we had trouble, my friend! During our April 4, 2009 public night, the shutter (the sliding door that covers the opening in the dome) began acting up. It was difficult to open for the night and was nearly impossible to close! College carpenters built up a scaffold inside the dome and determined that the rollers that carry the shutter had derailed — nominally the rollers move along an iron bar at the top of the opening easing operation. The craftsmen lifted the shutter back on to its tracks and lubricated the wheels. With the scaffold in place the telescope could not be moved so all use of the Observatory was suspended during the balance of April and through May. While the scaffolding was still in place, over the late-May Memorial Day weekend, we replaced the pull ropes that are used to manually open and close the shutter. The shutter works better than it has in years though close examination of the condition of its wooden components left us with worries. Memorial Plaque Restoration: In February 2009 we completed restoration of the Stephens Memorial dedication plaque. Unfortunately we don’t know the full history of the plaque but in 2006 it was in terrible condition. Although we found the plaque on display indoors –in the Observatory’s entryway– it had been stripped of any protective coatings and had developed a very unattractive ashen patina. Bronze can be destroyed by “bronze disease” when neglected and left in hostile conditions. After some cleaning and amateur restoration effort we concluded the plaque would benefit from professional attention and had the restoration completed by All-Craft Wellman Products, Inc., of Willoughby. The plaque has been restored to what we believe was its original appearance and its new protective lacquer coatings ought to preserve its beauty, and the Stephens family’s memory, for many more years to come. In November 2008 we received the generous donation of an Odyssey 10 Dobsonian-mounted reflector from Bill & Lee Ann Anderson. The 10-inch telescope is portable enough for us to deploy to the Observatory grounds as and when needed, is simple to use, yet is a real “light bucket.” The telescope has a focal length of 1,270mm and its Coulter Optical mirror a focal ratio of f/5. We are happy to accept a limited number of donated telescopes for programming and educational use. We would be delighted to be offered a large “professional- or research-grade” telescope to serve as the centerpiece of a new facility to join the prestigious vintage Cooley Telescope. Those who may have something to offer us should contact us in advance of any donation to ascertain whether we can use the equipment. Donations supporting the construction of a new facility would also be warmly accepted. The outdoor wall sconces were replaced in September 2008. The originals were literally falling apart as years of corrosion ate away at the thin metal strips holding the units together. Modern “antiqued” shaded fixtures replace the originals and compact florescent lights were installed in them. We plan to replace the CF lights with LED bulbs reducing wattage, illumination, and eliminating the last bit of glare as we try and set a good nighttime lighting example. In September 2008 the cement stucco wall of the observing chamber (the curved room under the dome) were scraped to remove flaking paint. The wall was painted as were the already-painted faces of the capstones that support the dome and its rotation mechanics. The weight-driven mechanical clock drive was removed in spring 2006 and was cleaned and restored by a local expert. The clock was mechanically sound but oil had grown old and gunky, holding dirt which can damage gears. The goal of the work was accurate and reliable operation without undue wear to the +100-year-old mechanism. The result was a clock drive that not only runs well but looks beautiful. The drive looks like it just came from a jewelry shop thanks to area tower clock expert Frank Del Greco. For a “before and after” look at the clock, visit this page. It was reinstalled in October 2006. The objective lens cell was removed in the summer of 2006 and was taken to the Brashear Division L-3 Communications plant in Pittsburgh, Penn. for examination, cleaning, and adjustment. There was a white, cloudy deposit between the elements that may have affected image quality or even proved damaging to the glass. Brashear is the descendent of the original John Brashear Co. that made the objective in the first place. After a century and several changes in organization and ownership, the business continues today as a respected world leader in telescope optics. Upon dis-assembly, technicians discovered and repaired a chip in the edge of one of the lenses. Of course the glass was also expertly cleaned. The objective is now sparkling and, after a review of optical test results and consulting with optical and historical experts, the unit was reassembled with crown glass forward (see our technical page on the lens). The Brashear-equipped brass finder telescope was refurbished late in 2006. The finder’s tube had tarnished to an ugly brown/green and its surface was stained, dirty, and pitted. See what it looked like then and now, after restoration; visit this page. The observatory also owns an orange-tube Celestron 8 SCT dating from about 1980. The 110V electrical supply cord has turned up so now we can see if the telescope’s built-in clock drives work (Celestron doesn’t stock the cord). The Celestron appears to be in fine shape optically but could use a much better mount and tripod. We continue to work on cleaning up and fixing up of the observatory building. The office windows have been repaired, door and wood trim painted, and the dome’s exterior has been painted thanks to the College. We’re also pleased to see the new look of the flagstone walkways that lead from the street to our front door. Overgrown sod was cut away by Hiram College’s grounds-keeping staff and it looks like a new walk made in the old style! Overall the grounds look much better and present a much better image in the community.